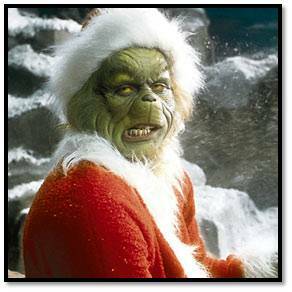 One of my favorite films for Christmas is Jim Carey and Ron Howard’s version of the Grinch. Yes, I know that it was a SPLAT on Rotten Tomatoes. I know that it still gets painful reviews each year. I know that children cry when they are asked to watch the film. But I like it. It makes me laugh. And for my family, it is the perfect movie to watch this season. Jim Carey isn’t any Jimmy Stewart and the Grinch isn’t any Wonderful Life but it still remains a classic in this house. Curt, I cannot remain silent on this one. You are right on target – most of the time. But not now! This is one of the WORST movies ever. It is not the Grinch, but Jim Carey being Jim Carey dressed as a Grinch. And the rest of the world agrees with me. I only hope that we can remain friends after hearing of your ageusia (complete and utter lack of taste) as far as movies go. I am so with you on ugly ties, but the Grinch? The Grinch?!?!?!? I want to thank you for your critical analysis of my most recent post, “The Grinch Who Stole Christmas, Again”. While your remarks waste no time getting right to the point, I would like to probe this issue a little further. What are your thoughts on other Christmas movies that I would rank high on my list of holiday greats? Let’s use, for example, my all time favorite, “Die Hard”. How do you feel about Bruce Willis in this movie? Isn’t he more than just Bruce playing a barefoot cop? Doesn’t he bring angst and pain to the Towers as he drags his bleeding feet across the glass scattered floor? And, AND, during a Christmas Party, of all times? What say you to this, Mr. Drumm?